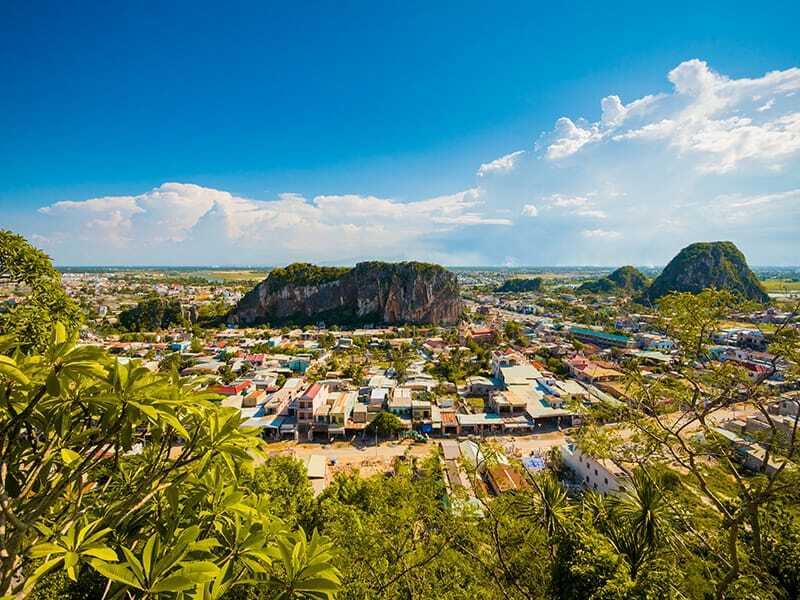 Surrounded by sandy beaches and located near the Buddhist pagodas and caves of the Marble Mountains, the once small town of Da Nang is a growing, bustling port city lying halfway between Hanoi in the north and Ho Chi Minh City (formerly Saigon) in the south. 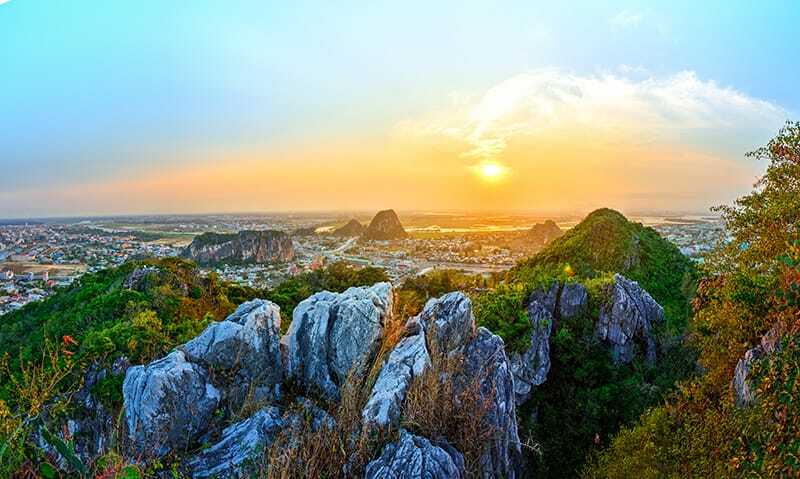 As the third largest city in Vietnam, Da Nang is a great place to visit in its own right and not just as a stopping point to nearby attractions such as Hue Imperial City, Hoi An Ancient Town, My Son Sanctuary, and Phong Nha – Ke Bang National Park. Despite its large urban population, Da Nang life runs at a slightly slower tempo than frenetic Hanoi or Ho Chi Minh City. Perhaps it’s the isolated beaches that invite quiet meditation, the friendly people, or the lighter traffic on the streets; whatever it is that makes Da Nang so enjoyable, you should plan a few days to explore the delights this city has to offer. Da Nang lies within the former kingdom of Champa, a culture heavily influenced by Hinduism brought from India. Even today, the Cham culture is exhibited in the architecture, food, and Chamic languages still spoken throughout the region. In the 10th century, the Dai Viet (cultural Vietnamese) began an inexorable sweep from Northern Vietnam south into the Da Nang area and beyond, eventually conquering the Champa leaders and taking over their territories. While a small village existed on the site beginning in the 14th century, Da Nang wasn’t settled as a seaport until the 17th century, when it began attracting traders from Europe and Asia. Despite its trade and the area’s beauty, it was still a backwater town until Napolean III annexed it for the French Empire in 1862, and in 1889, the French colonial government renamed the seaport Tourane (or Turon). As French influence and power grew in Vietnam, the seaport also expanded and grew until it became one of the five major cities of French Indochina, included among Hanoi, Saigon, Hai Phong, and Hue. French colonial architecture, food, and fashions layered atop the Cham and Dai Viet influences already present in the city and surrounding area. When the French left Vietnam in 1954, the country declared independence as a nation. Da Nang was the scene of many battles during the Vietnam War (the Vietnamese call this war the American War). It was the first landing site of American troops in March, 1965, and the scene of many bloody conflicts throughout the ten years of the war. Despite the conflicts and setbacks suffered by the city and its people, Da Nang has flourished in the years after the war. Industry and manufacturing play a major part in its growth, and tourism is one of the most rapidly growing industries in the city. The weather is ideal from April through September, with the ocean regulating and cooling the city during the hottest summer months. Winter, from the end of September through January, is still mild in temperature, but rain showers are an almost daily occurrence during this monsoon season, along with occasional fierce storms coming off the South China Sea. If you plan on visiting Da Nang in winter, be sure to pack an umbrella. Da Nang is situated at the mouth of the Han River that exits from the East Vietnam Sea. On the north, Da Nang hugs the Da Nang Bay, while the long waterfronts of the east and south border the Han River and the Song Cam Le River. In Da Nang, you’ll find gorgeous white sand beaches, superb vistas, a wide range of restaurants and eateries, plenty of shopping, and tons of culture and special sites to visit. Within the city and the surrounding area, you’ll recognize the Cham, Da Viet, French Colonial, and modern Vietnamese and global influences that have helped shape this seaport into a city that is friendly towards visitors while successfully preserving its own heritage. City authorities have launched a multi-year campaign designed to make Da Nang the most modern city in Vietnam by the year 2030. It’s an exciting time to visit! 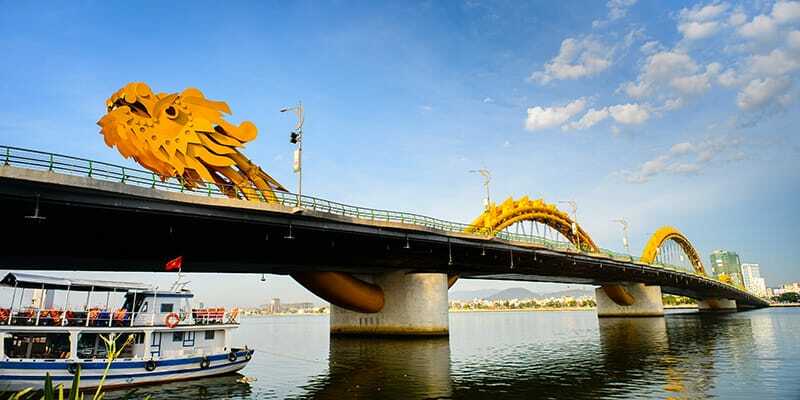 From the iconic Dragon Bridge to the wild beauty of Son Tra Peninsula, Da Nang will make you glad you came. Each of the five craggy peaks that make up the Marble Mountains, located nine kilometers (5.5 miles) south of Da Nang and near the China Beach coastal road, is named after the element it is said to most closely resemble: water (Thuy Son), wood (Moc Son), fire, (Hoa Son), metal or gold (Kim Son), and earth (Tho Son). 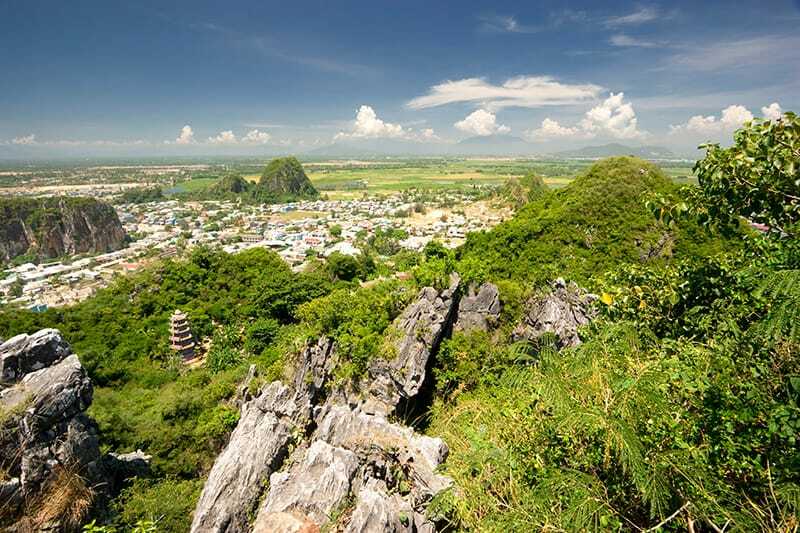 Though each peak is topped with a pagoda, only the largest mountain, Thuy Son is open to visitors. Within Thuy Son lies a series of caves, tunnels, and sanctuaries originally dedicated to Hindu gods and later turned into Buddhist temples and sanctuaries. Visitors can enter the cave system and traverse a series of tunnels, stairs, and paths as they wind through the various caverns up to the summit of the mountain. The caverns and grottoes are filled with religious carvings on the marble walls as well as numerous statues of Buddha. At the base of the mountains lie villages whose residents specialize in marble carvings and statues. Until recently, the marble they used actually came from the Marble Mountains, but marble is now shipped in from nearby provinces in order to preserve the integrity of the mountains. 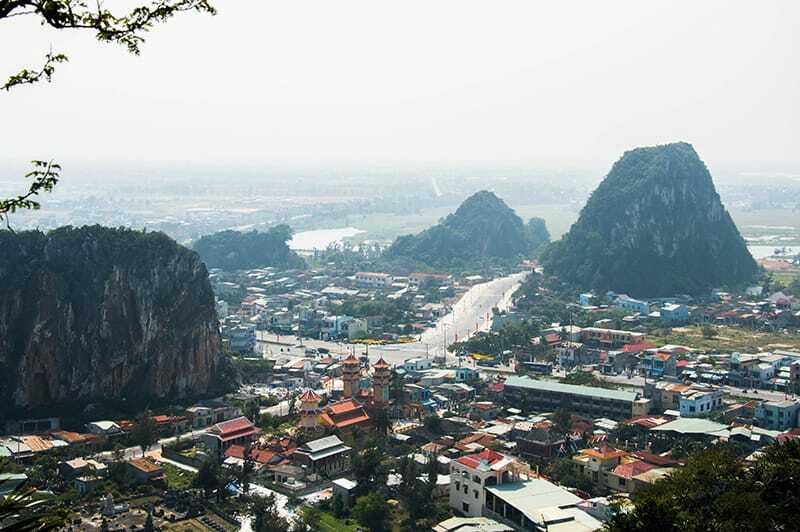 You can get to the Marble Mountains by bus or taxi from Da Nang for a very reasonable price. The entry fee to the caves is around 18,000 Vietnamese dong (VND), or less than one U.S. dollar. An elevator is available for those who have difficulty walking up hills or climbing stairs, but be prepared for a workout if you want to get to the summit. 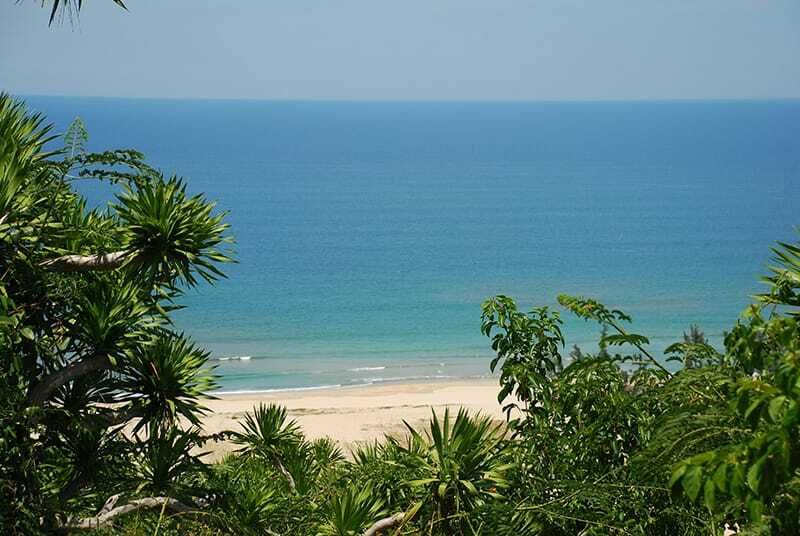 Escape the hustle and bustle of the city and let yourself marinate in the wild natural beauty that is Son Tra Mountain, 56 km (35 miles) from Da Nang. 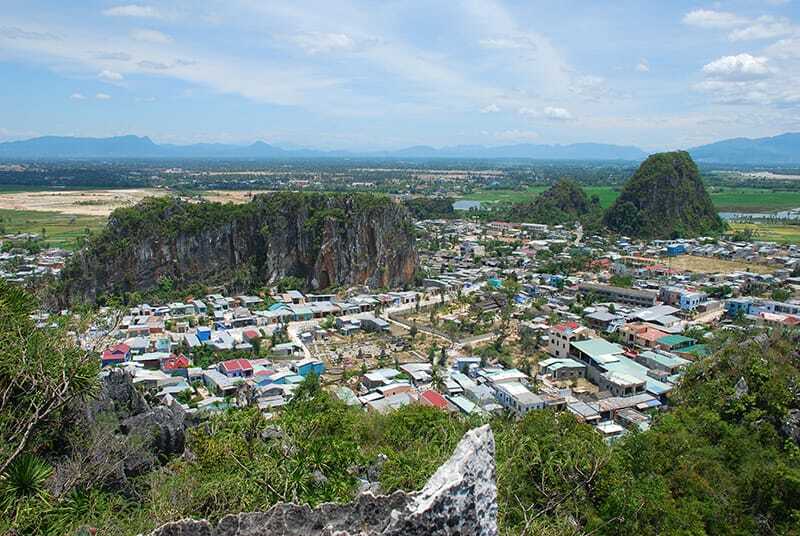 Known to the locals as Son Tra Peninsula, the mountain is nicknamed Monkey Mountain because of the population of rare and endangered Red Shanked Duocs (langurs) and other primates that freely roam the primitive jungle that blankets the peninsula. The drive is breathtaking, with a good road winding around the mountain, through jungles, and above the city. Pristine white beaches lie against clear waters that hide a treasure trove of coral reefs—a wonderful place to snorkel and swim. 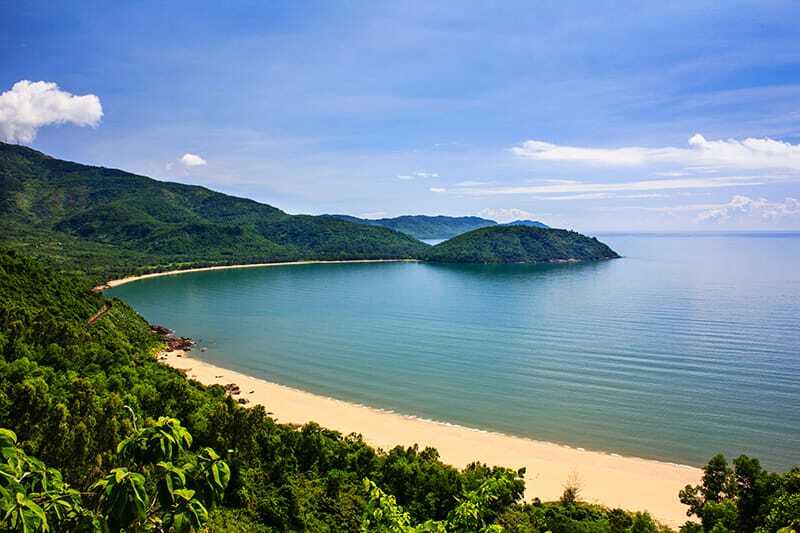 Hikers can climb up through the jungle to the 693-meter summit from Bai Bac Beach, a journey of about four hours of moderate hiking (around seven or eight hours round-trip). Son Tra Mountain is a lovely day trip, but you can also find accommodations in one of the small mountain villages if you wish to spend more time in this tropical paradise. The best way to take in all the beauty of this place is on the back of a motorbike, in an open Jeep, or on foot. Don’t forget your camera! 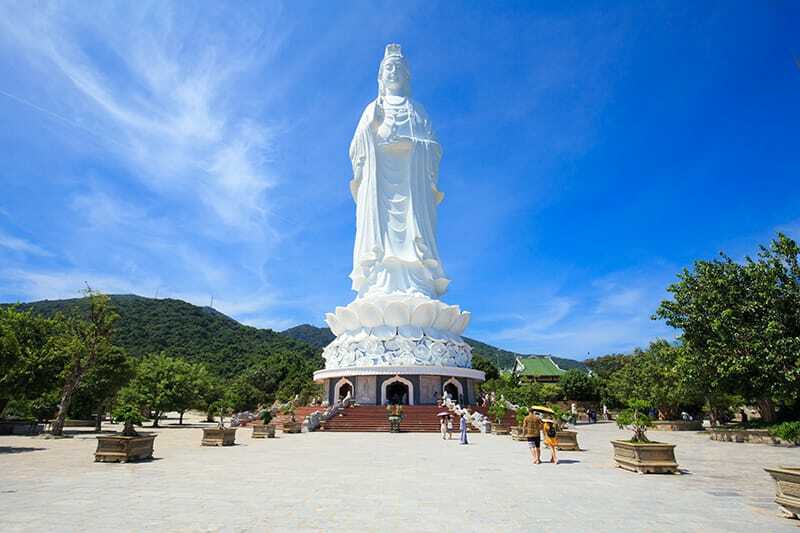 The tallest Buddha statue in Vietnam, Lady Buddha stands in a place of honor at the Linh Ung Pagoda on Son Tra Peninsula, about 14 km (8.5 miles) from Da Nang city center. The 67-meter tall statue stands in a massive lotus blossom that floats above a visitors’ center. 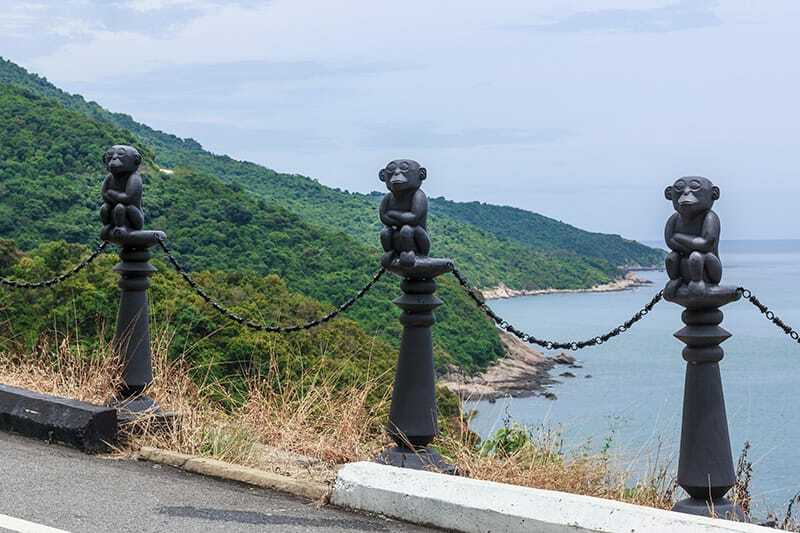 Visitors can climb 17 stories up through the center of the statue to gaze out at panoramic vistas of the ocean, beaches, jungle, and city below as well as the 21 unique Buddha statues placed at an alter on each floor. A 2-meter tall Buddha statue sits on top of Lady Buddha’s head like a hat, and the statue faces the ocean, her back to the mountain, blessing the water and protecting Da Nang from the weather. The statue is visible from any point in Da Nang City. The pagoda in which the Lady Buddha stands is a celebration of both modern and traditional Vietnamese architecture. Shaped like a turtle, the complex encloses 20 ha (close to 50 acres) of space, the largest pagoda in Da Nang, and a place of quiet tranquility amongst the jungles and beaches of Son Tra Peninsula. Small temples, plantings, and statues adorn the grounds of the pagoda. Entry to the pagoda is free, but parking requires a small fee. The inviting and refreshing cooler temperatures up in the Ba Na Hills is enough to entice anyone to make the 50 km (31 miles) journey west of Da Nang on a hot summer day. It’s the views that will make you linger. 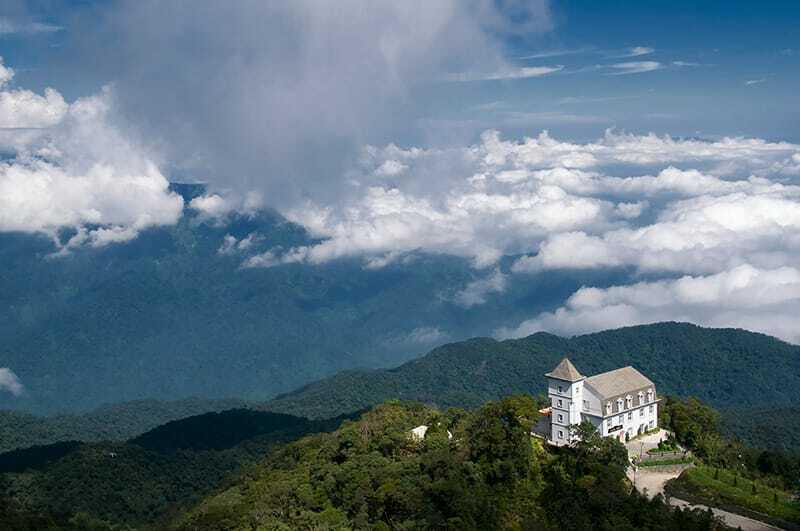 A favorite spot for ecotourism, the Ba Na Hills boast a vast array of flora and fauna. Resorts, villages, and hotels built along the slopes welcome those who wish to explore the area for multiple days. While visitors can make the fairly easy climb up the 15-km switchbacks to the summit of Ba Na Mountain, a cable car system—the longest in the world—allows you to soar above the stunning topography and take in views of Da Nang, the bay and beaches below, Hai Van Pass, Son Tra Peninsula, Marble Mountain, the Thu Bon River, and Cu Lao Cham Island during the 17 to 20 minute ride that sometimes gets you above the level of the clouds. You’ll find excellent eating at both the top and bottom of the mountain, as well as family-friendly activities all along the way. Surprises include a French castle built on the hill, an indoor gaming park, and beautiful walking gardens. Wear good walking shoes and bring plenty of water, though drinks and food are available in cafes and restaurants. Expect to pay a ticket fee for the cable car as well as entrance fees to the gardens and other attractions. The Museum of Cham Pa houses a truly impressive collection of Cham artifacts, statues, and other relics left behind from the Cham Pa kingdom that ruled what is now the central and southern regions of modern Vietnam from the second century AD to the 19th century. Located at the intersection of Trung Vu Vuong Street and Bach Dang Street, the museum was opened to the public in 1939 by the French’s Oriental Research Institution. An audio tour is available to visitors, and this tour is an excellent way to learn more about the hand carved statues, some preserved for centuries. For those who do not wish to have the audio tour, description tags and signs are written in Vietnamese, French, and English. Allow between one and three hours to visit the museum, depending on your level of interest. There is a small entry fee. Tours are a great way to see some of the best parts of Da Nang. Local guides often speak English and French and can take you to restaurants, markets, tourist attractions, and other sites you might otherwise miss. You can also book a tour to some of the nearby attractions outside of the city without worrying about directions, transportation, or carrying along bulky guidebooks. Tour operator Xuan Tu (sounds like “Soong Too”) or one of her very personable tour guides takes clients on an educational tour of both Da Nang and Hoi An Ancient City. 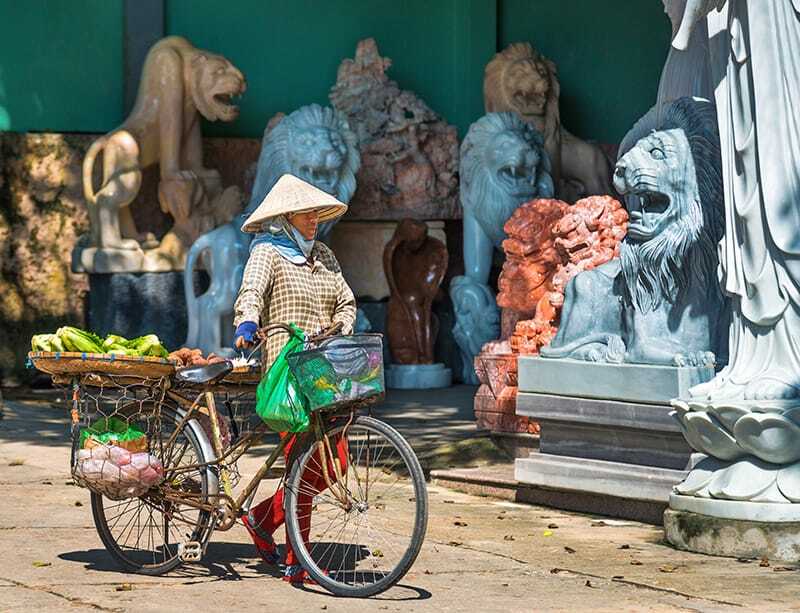 With stops at out-of-the-way places that most foreigners never get to see, you’ll get a glimpse of real Vietnamese life, including recommendations to eateries, hidden spots, and resorts that are the best of the best. Xuan Tu and her crew are dedicated to taking excellent care of their clients, from pick-up to drop-off. The air-conditioned tour van keeps the ride comfortable and smooth. To view the available tours and book your spot, click here. Viator runs a special full day tour around the city of Da Nang and nearby points of interest. After pick-up from your hotel, your tour guide will take you to see the Lady Buddha, the Dragon Bridge over the Han River, the Marble Mountains, and more. The cost of the tour covers all entrance fees and bottled water. Guests are responsible for their own food and drink beyond bottled water. Click here to view the schedule and to book a tour. 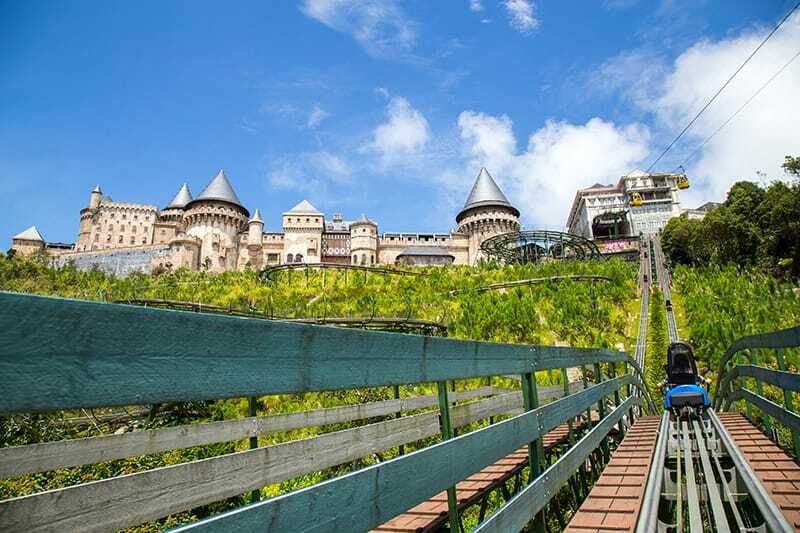 Ba Na Mountain (Ba Na Hills) boasts a French resort at the summit. Built in 1920, the resort continues to be attractive as a way to escape the summer heat of Da Nang and enjoy cooler air on the mountain. Fantasy Park, a small indoor games park, has been built around the resort, and provides entertainment for kids and adults of all ages. Gardens and other amazing visiting spots nestle along the slopes. The Ba Na cable car is the longest in the world at 5 km (3 miles). Riders get a panoramic view of the Ba Na Hills, the Linh Ung Pagoda (Lady Buddha), and more during the trip up the mountain. 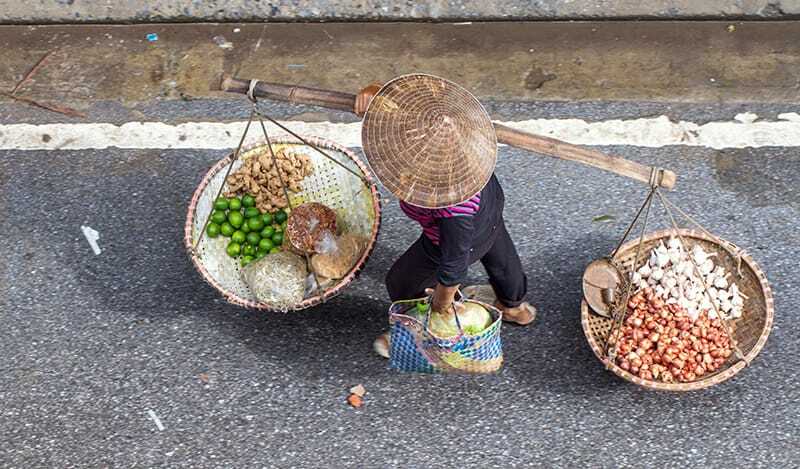 One-day tours start at $46 and include pick-up from your hotel, the ride to the mountain, cable car tickets, and stops at the sights as you ascend the mountain, lunch, and the return trip to Da Nang, including shopping at Central Specialties Super Market, before drop-off back at your hotel. Click here to get pricing and scheduling information for this family-friendly tour. Man Nguyen, an enterprising young tour guide who has made a name for himself by offering top quality tours around Da Nang, Hoi An, Hue, and My Son Sanctuary, has delighted dozens of customers with his entertaining and knowledgeable commentary. Tours are conducted on motorbike, pushbikes, or air-conditioned cars as the weather dictates. Man’s command of English, along with his well-developed knowledge of the history of Vietnam, make this one of the most informative tours you can book. Choose from a standard tour or work with Man to customize a tour to your specifications. Click here for more information, booking, and pricing. Food, one of the most essential aspects of human life, is a vitally important way to get to know a culture. The ingredients, flavors, and methods of cooking reflect the ingenuity and inventiveness of the culture that developed the variety of dishes found in a region. You cannot really visit Da Nang without trying out the dishes that have made the area famous. Da Nang cuisine is renowned throughout Vietnam as being particularly delicious and full of flavor. Because Da Nang is also one of the most economical places to live in Vietnam, visitors enjoy great food along with very reasonable prices. That means you have no excuses when it comes to sampling some of the dishes that have given Da Nang cuisine its superb reputation. 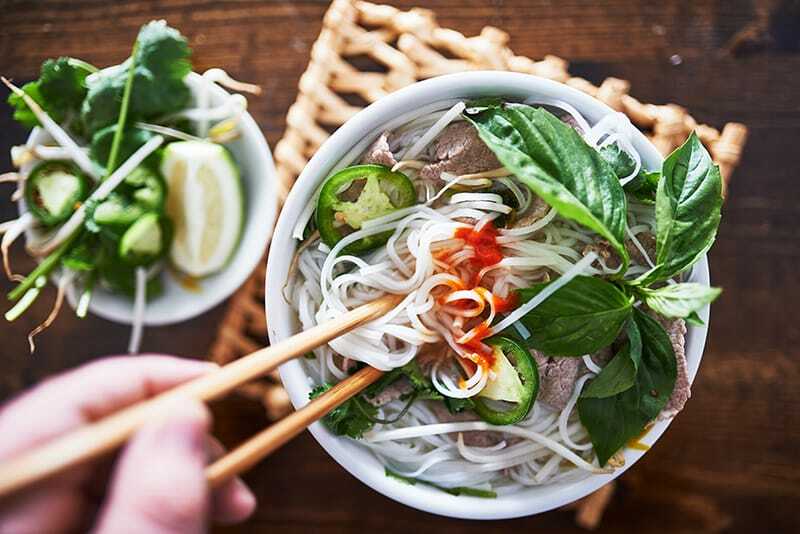 For those not familiar with Vietnamese cuisine and who are feeling overwhelmed with the options, a food tour is the answer. Food tours let you sample from some of the best restaurants and food stands, places that are popular with tourists as well as locals. Guides give you information about the ingredients used, preparation style, and how each dish fits into the local cuisine. This can take the fear factor out of trying unfamiliar flavors and ingredients, and you might even come away with new favorites to add to your repertoire. Book a tour with a reputable tour company like Viator (see their food tour options here) or step out with a private tour guide—most of whom are dynamic, friendly, and have made personal connections with local merchants and restaurant owners to provide a top quality tour in their home town. Modern, spacious, and well-staffed, Fatfish restaurant sits on the eastern shore of the Han River, near enough to Dragon Bridge for patrons to watch the colorful pyrotechnics and water show from the mouth of the dragon on Saturday and Sunday nights. Fatfish offers craft beers, wood-fired BBQ, fusion dishes, pizza, and vegetarian entrees to very satisfied customers. Location: 439 D Trun Hung Dao. Open 9am—11pm seven days a week. Prices range from 70,000 VND to 285,000 VND (around $3 to $12). A detailed booking form allows Summer Le, operator of the Funtastic Food Tour in Da Nang, to tailor food tours to your specific preferences. Tour stops include local favorites well off the beaten tourist path, and knowledgeable tour guides can talk extensively about the dishes, ingredients, preparation style, and how each dish fits into Da Nang cuisine culture—a great way to get to know this vibrant city. Lunch or evening tours are small (from one to eight people, though accommodations can be made for larger groups) and include 10 dishes at five separate stops. The tour fee includes transportation and all the food, and you’ll get some great recommendations for other places to visit from the guides. Click here to book your tour! 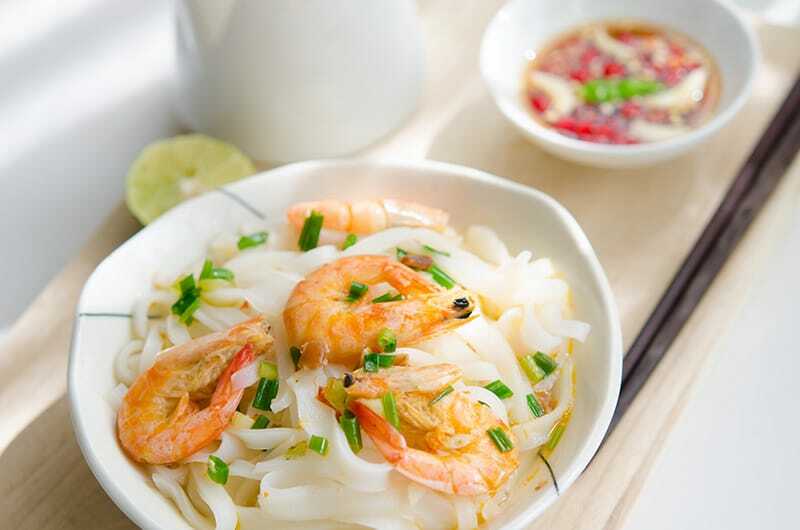 Mi quang is one of Da Nang’s most iconic dishes, a delicious noodle soup consisting of flat, thick rice noodles seasoned with turmeric, fish sauce and broth, pork, shrimp, boiled eggs, peanuts, and greens served alongside a bowl of salad and bean sprouts. It’s warm, it’s comforting, and it’s a dish that has made Da Nang cuisine famous. Mi Quang Ba Mua restaurant has capitalized on this versatile dish by offering a wide range of topping options. Choose your meat (try one of the more exotic meats like eel or frog!) and your toppings, or have the staff choose for you. Because of its popularity with foreign travelers, Mi Quang Ba Mua offers an English menu, so you’ll know exactly what you’re selecting. Find Mi Quang Ba Mua at 19 Tron Binh Trong Street, open from 6:30am (breakfast!) to 9:30pm. Although Da Nang is the third largest city in Vietnam, the pace here is a little more laid back than Vietnam’s other large cities. Friendly people, less traffic on the streets, a close proximity to beautiful beaches and breathtaking vistas dotted with sacred sanctuaries, resorts, and historic sites makes Da Nang a special place. In addition, Da Nang cuisine is renowned throughout Vietnam for its flavor and versatility. For the traveler hoping to gain more insight into Vietnam’s culture and history, Da Nang is a must-visit seaport at the mouth of the Han River. Da Nang is located about halfway between the major cities of Hanoi in the north and Ho Chi Minh City in the south. 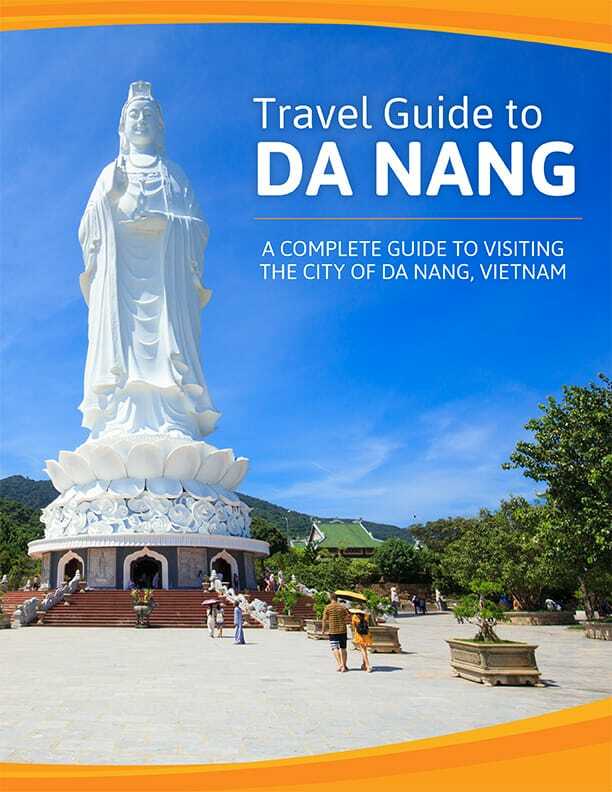 You can easily access Da Nang by train, car, or plane.